RSMail! revision 14 comes with absolute path support for links, additional newsletter reports (opens history), new unsubscribing options and several updates as well. Starting with this revision, RSMail! offers absolute path support not only for images, but for links too. When this option is enabled , RSMail! checks the newsletter for relative paths and if found, it automatically adds the domain in the URL. 2. New "Opens history" report and updated "Link history"
If enabled, RSMail! is able to track the link history (a report of the users that clicked the message links) and starting with this revision, the opens history (the users list that opened the newsletter). Both reports display via the “Reports” tab, additional subscribers information such as date and IP. Notice that RSMail! tracks the reports, only if these functionalities are enabled when sending the newsletter. If both reports are enabled in the moment of sending the newsletter, you'll find the "opens history" and the "link history" in the "Reports" tab. The "opens history" report can be accessed by clicking, in the "Message statistics" area, on one of the "Opens" or "Unique opens" reports. Upon clicking one of the above links, you'll have access to the users list that opened the newsletter, along with their IP and date. Users have the possibility to unsubscribe themselves from the mailing list, based on the “Unsubscribe” link received in the newsletter. 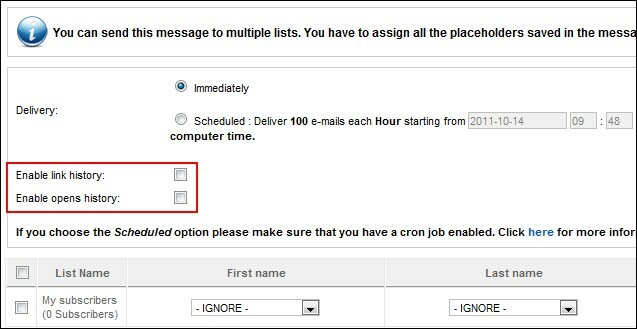 Revision 14 enhances the unsubscribing process, by allowing administrators to manually unsubscribe users directly from the back-end. We’ve optimized the way that RSMail! handles the bounce emails (emails that, from one reason or another, cannot be delivered and are returned to the sender) and updated the source code to assure an increased performance. The user can only be unsubscribed by an administrator from the backend RSMail! 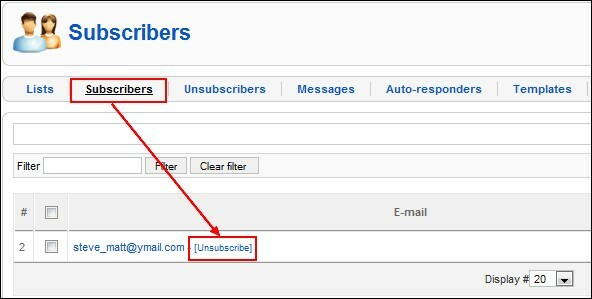 subscribers area or directly by the user via the "unsubscrib e" link that resides in a email. I found an issue that when people register then they are added in the subscribers list (based on Joomla users) but they are not automatically removed when they delete their account. What do u say? Hello Wouter, that's correct. While the "opens history" report has just been included (starting with RSMail! rev. 14), the "link history" report is rather old (since rev. 5 - check our changelog http://www.rsjoomla.com/support/documentation/view-knowledgebase/135-changelog.html). The "link history" report has been improved in this revision: now, is able to track the subscribers' IP and date. The report can be accessed from the RSMail! "Reports" tab. Under the "Message statistics" , you'll find listed all the newsletter links. On the right area you'll find 2 reports: "Unique clicks" and "Total clicks". By clicking on one of them, you'll access the "link history". Notice that RSMail! can track thesse reports only if they are enabled each time a new campaign is sent. I thought that link history was new and personalized like opens history. Now I understand that it is not new and not personilized but that you can put it on or off. The Opens history and the absolute link works fine; thanks. It is however not clear where to find the link history.